Now available my Screensaver for PC's Featuring "The Tools"! Beautiful photos of salads with my mottos to keep you motivated. Also a calendar too! Purchase for $1.95 through Paypal, just send payment to june@junefit.com and upon verification i will send you the program. THIS is CREATIVE Eating, a new concept of eating, thinking and behaving leading to permanent weight loss. Follow me through my personal journeyand through my professional experience as a fitness trainer, weight loss specialist and behavior specialist, with all "The tools" of my program, my best weight loss & fitness tips, recipes, menus along with my weekly tips and more. Featuring my Salad a Day, recipes.Start today to become leaner and healthier, no matter what your age or weight. In my opinion, cooking and eating are among our greatest sources of pleasure aside from them being a life necessity. Food Feeds our Senses is one of my tips, and it does from our sight, sense of smell, taste, and sense of texture when we eat. Yet, too many of us are at odds with food. We love food, yet feel controlled by it. It arouses fear, anxiety, and a host of negative emotions along with the temporary pleasure we derive from it. Too many of us are afraid to obsess about food, yet we do. Too many of us learned somewhere down the line to feed our emotions with food, and I always tell my clients that if overeating didnt have so many drawbacks from the negative effects to our physical health, mental health, and appearance, it would make a wonderful coping tool. Today, women are more concerned with their health, weight, fitness and appearance including anti-aging than ever before, and girls are starting to diet earlier than ever before. Were also bombarded with more nutrition information, more diets and dieting gimmicks than ever before. Hence too many of us are more confused than ever before about how to lose weight, keep it off and be healthy at the same time. I read somewhere the saying that all diets work if we work them, but Id like to say that not all diets are equal. Not all diets lead to permanent weight loss, nor are all diets healthy. We turn to doctors for credibility, or fitness gurus who look the part, both leading us down a path that may or may not be credible. Not all diets are satisfying either, and just the word diet can stir up cravings for the most fattening high calorie dense foods. I have witnessed this with some of my clients eating foods that they dont particularly love just because they are the restricted foods or the foods we customarily celebrate with. I have listened to clients tell me that they avoid certain foods that are known for their health benefits when they do want to feed an emotional craving or celebrate, because healthy foods dont meet the forbidden purpose. Hence I wrote, Its in Our Perceptions, specifically addressing this. I myself remember my first attempt at losing weight, but I dont remember all the different diets and weight loss efforts I made over the years; there were just too many to remember. I do remember always being on a diet up until about a decade ago. Its a Process is one of my mottos and looking back, I can apply this to myself. Like so many young women, I had an ideal body image in mind when I was a teen. Looking at the magazine models gave me a specific picture of what I thought my body should look like. In fact, as I tell my story later, youll read how at the age of 16, I took drugs to lose. I spent much of my adult life on a diet trying to match that body in the magazine until this last decade where I found a way of eating that I enjoy, My Salad a Day. It forms the foundation of my creative eating program, it maintains my weight, I feel really good about, and best yet, it is not a diet, a traditional one that is. Im pleased to share my personal journey along with my professional experience so that the process of finding a creative way of losing is much shorter for you my reader than it was for me. Ive worked with women from 10 Lbs. overweight to over 100 Lbs. overweight, and we all share the ups and downs of finding a permanent weight that we can feel good about. I often tell my clients that I have rarely met a woman who feels great about her weight or body including women who are not overweight, so for those of you who struggle with weight issues, I do understand. I was overweight myself, and Im here to say that it is never too late to start the change process. The biggest changes in my body didnt begin until after 40, so lets begin. Ive compiled my best tips and more, to share how, without dieting. I call it Creative Eating. I consider eating an art, and finding a way to eat to lose as a challenge, hence Its Not a Diet, Its Creative Eating. Ive written this book so that it may be read cover to cover as well as read by individual chapters that stand -alone to be used as a tool when needed. Many times I repeat concepts in different tips, and you will find recurrent themes, sayings, mottos and more, repeated throughout. I call it gentle brainwashing! 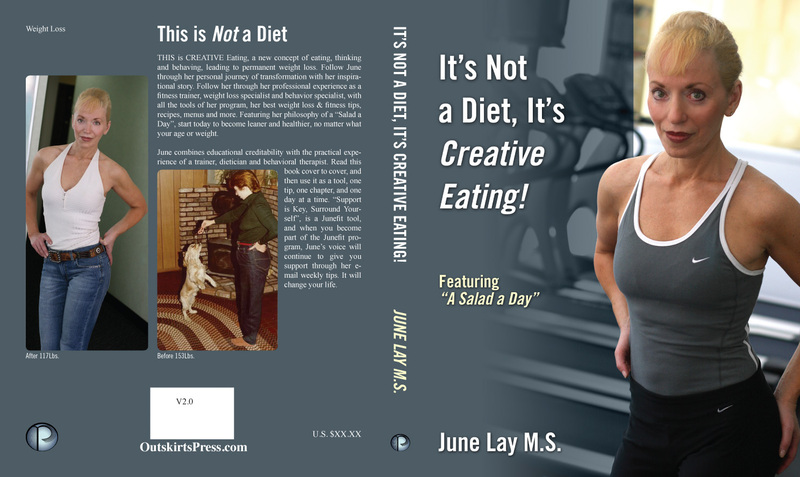 I love Creative Eating and Not Dieting. My clients agree and I hope you my reader will too. Photos by Anthony grasso Photography!